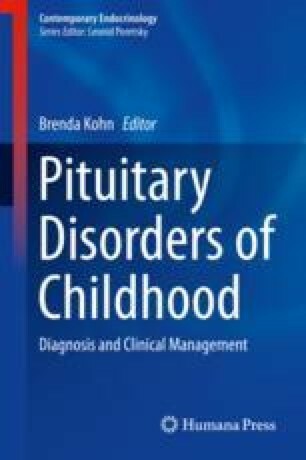 The purpose of this chapter is to highlight neuro-ophthalmic disease processes that have implications for endocrinologic function. We have sought to emphasize those relevant conditions which occur most commonly in the pediatric neuro-ophthalmic practice. Many of these conditions involve disease processes that localize to the sellar and suprasellar regions of the brain, with the potential to impact visual function at the level of the optic chiasm and hormonal function at the pituitary and hypothalamus. Each of these conditions warrants a multidisciplinary collaboration between neuro-ophthalmology and endocrinology to achieve the best clinical outcomes. Tosur M, Tomsa A, Paul DL. Diencephalic syndrome: a rare cause of failure to thrive. BMJ Case Rep. 2017;2017. pii: bcr-2017-220171. https://doi.org/10.1136/bcr-2017-220171.